A decade ago, the Mozilla project was in something of a crisis. The once-dominant browser (a direct descendant of Mosaic, the first graphical browser) had long ago been surpassed in usage by Microsoft Internet Explorer, in part the result of Microsoft’s leveraging its dominant operating system to recapture the Internet. Mozilla was born when Netscape Communicator‘s code opened up to the global developer community, the first piece of “household name” software to go from proprietary to open source code. But the simple browser had become a full-blown suite of communication tools — Email, chat, even a web development environment. All of these tools loaded at once, clogging up computer memory (slowing down computers) and chewing up dial-up bandwidth (slowing down the web). Mozilla needed a strategy to keep the project from spiraling into oblivion. Kudos to the person who had the idea to split up all the tools, and allow people to run just what they wanted. Thus, Firefox was born! This was the first of the lean browsers, lightning fast for its time, both for loading pages and simply displaying on the screen. Firefox also introduced the idea of modular extensions, allowing independent developers to add functionality to the basic browser engine provided by Mozilla. Mozilla’s email client became Thunderbird, and won many fans. The web coding tool, Composer, spun off into a series of different applications, none of which ever became popular. Because the code was still open source, even the suite continued under the SeaMonkey banner. All this code runs on practically every operating system known to humans and bots, including the Firefox OS for mobile devices. Firefox reignited the browser wars, and eventually eclipsed Internet Explorer by out-innovating Microsoft. As a result, Google got into the browser business with Chrome. These days, Chrome is at the top of the browser pile, with Firefox, Apple’s Safari and IE trailing. As with many things Google, Chrome is a proprietary browser running atop open source code, called Chromium. Today, the Firefox team released the Firefox Developer Edition, a special browser with built-in tools for both the mobile OS and ordinary web designers and developers. I’ve got this downloaded, and hope to learn more about it in the coming days (if you’ve read through all my NaBloPoMo posts this month, you’ll know that I’ve got a lot of learning ahead of me). Meanwhile, I continue to use Firefox as my primary browser, in part because of its open character, in part out of habit. Happy Birthday Firefox! November 8 should have been Aaron Swartz‘s 28th birthday. But for an overzealous prosecutor, Swartz would likely still be innovating, still be rousing the rabble, still be sharing information that the rest of us need. I didn’t know much about Swartz the human being while he was alive, but what I’ve learned about him since he died almost two years ago has been quite the inspiration. Go read his Wikipedia page, if you don’t know of his legacy. Then go visit Reddit, another bit of code he helped with. At the bottom of this page, you’ll see another silent homage to Aaron Swartz: the Creative Commons license under which I share this blog’s conten. By the time you read this, it’s likely too late to take part in the Swartz Day hackathon happening in several cities around the globe. I’ve already missed the showing of the Swartz documentary, The Internet’s Own Boy at the Internet Archive in San Francisco. But you don’t need to participate in an official event to honor Aaron Swartz. You just need to take some steps in his memory. Share some important information with someone who needs it, be it on your own blog (Today would be a good day to start a blog, by the way), Reddit, on your favorite social media site — or live and in person. Information in the right hands is powerful , and Aaron Swartz knew that today’s powerful people hold information that keeps the less powerful in their place. So go empower someone today. So after a weekend of fictional travel in time and space, it’s time for me to get back to the real world. Besides the deadlines I’m trying to meet (and/or update), there’s always interesting stuff that catches my eye. Tonight I’m directing your attention to a new, semi-short (five web pages) history piece called Half an operating system: The triumph and tragedy of OS/2 by Jeremy Reimer at Ars Technica. This is a story I wish I’d written. This IBM product was the first “alternative” operating system I ever used. I started typing first “non-Microsoft” OS, but knew immediately that the folks who were around back then (and those who read Reimer’s story) would know that’s not correct. That was true by the time I got around to using it (Warp 4 in 1996, when I was a technology reporter for Isthmus Weekly in Madison, WI), but its origins go back much deeper. I’ve got a longer story to tell, but I’m afraid I don’t have time to tell it now. 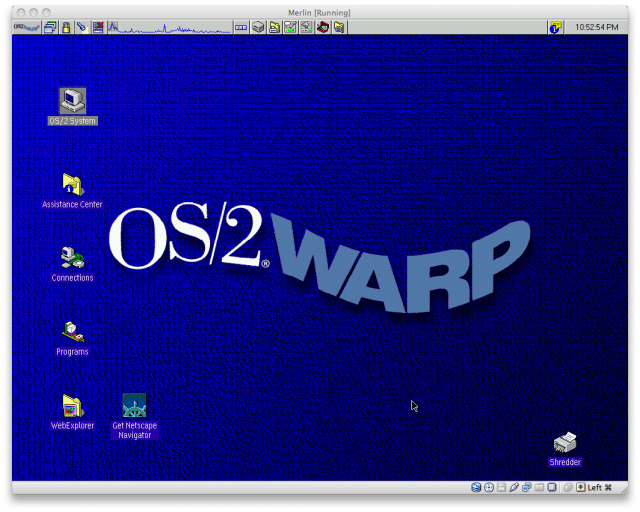 I will say that I still have my OS/2 Warp 4 box sitting in my office. Every time I install the VirtualBox virtual machine system, I always note that VB supports OS/2 VMs. Someday I’m going to test that assumption. Did you run any version of OS/2? I’d love to hear your stories! Feel free to comment on the Ars story too.